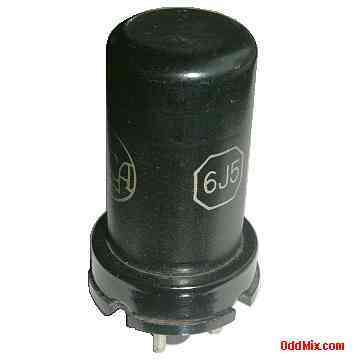 This discontinued, metal, 6J5 Medium-Mu Triode was made for RF oscillators or HF amplifiers in commercial receivers and research work. The triode has an amplification factor of 20 (Class-A) and also works well for AM/FM and general purpose oscillator circuits and for push-pull cathode-drive RF amplifiers. Excellent for those antique radio and television restoration projects or to set up a private vacuum tube museum. This tube is listed in the 1964 "RCA Receiving Tube Manual" as discontinued type or obsolete thus it is rare and highly collectible. It is a NOS tube - New Old Stock, unused, boxed, excellent condition.